EXPANSION of corn acreage in four US states--Michigan, Iowa, Minnesota and Wisconsin--to meet ethanol targets has reduced the number of insects involved in soyabean pest control. This in turn has triggered yield loss, excessive dependence on pesticides and an overall increase in cost of production. A study estimated crop loss due to pest attack on soyabean crops to be US $58 million for the year 2007-08. "Corn is a less favourable habitat for many ladybird beetles and other beneficial insects that feed on pests like the soyabean aphid (Aphis glycines)," wrote Doug Landis, professor of entomology at Michigan State University and part of the team that did the study. Agricultural landscapes with a high proportion of food crops like wheat, alfalfa and vegetable crops support a greater abundance of natural insects which keep pest population sizes low. 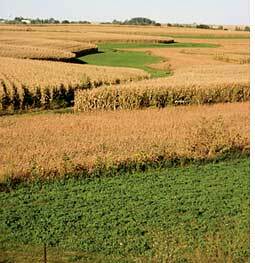 Monocrop landscapes like those occupied by bioenergy crops have been found to change habitat characteristics preventing the landscapes from supporting biocontrol. Corn acreage across usa increased by 19 per cent to a total of 37.9 million hectares due to cost reduction in production of minor crops and cultivation of fallow land under the Conservation Reserve Program Acreage in 2006-2007. From 2007 to 2008, the corn plantation declined 7 per cent, but remained the second highest since 1946, as per data by the US Department of Agriculture. Increase in corn prices and demand benefited corn growers but they incurred expenses in soyabean production. The study released in the journal Proceedings of the National Academy of Sciences (Vol 105, No 51) suggests alternatives to corn production like cellulosic ethanol obtained from grasses like switchgrass and mixed prairie. These would diversify agricultural landscapes and support multiple ecosystems while meeting biofuel targets.